He explained that the bodies are over 1,700 years old, which happens to coincide with the timeframe in which the Nazca lines (geoglyphs or artworks formed by lines drawn in the earth) are believed to have been created. Maussan included X-rays of the mummified remains in order to dispute claims made after the initial discovery in June that they were falsified or made of plaster cast. "Nobody has proven that it is a fraud. We are going to present preliminary evidence that will determine in the eyes of the media, that these are true specimen,” he said. 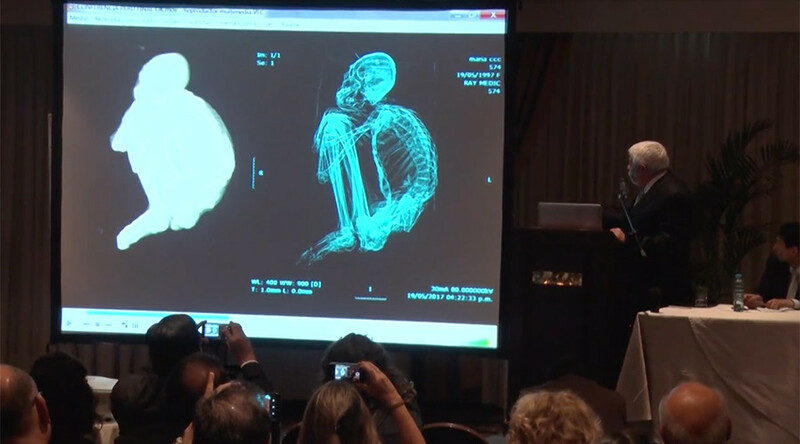 “And if there are still doubts that this is real, the obligation of Peruvians and the whole world is to preserve these bodies to find a true answer." The well-preserved 'alien' remains unveiled late last month allegedly measured 5 feet 6 inches (168cm) tall, had three long fingers and an elongated skull. "Apparently the body of a baby with the same characteristics according to the first analysis could be related. However, now it is necessary to perform a DNA test to be able to determine the relationship between the two," Maussan said. "Those are two bodies and there are three of which seem to have characteristics that are closer to reptiles than to humans. That is, we have five bodies." Maussan has long been criticized for hyping up the existence of extraterrestrials on Earth with dubious evidence. British UFO author Nigel Watson described the find as “a plaster cast model,” describing it as “110 perfect fake,” as cited by The New York Post. Watson’s theory that it’s simply a money-making scam bears weight, as attendees forked out a staggering $300 (£232) for the privilege of attending the conference and seeing the ‘aliens’ up close, according to Metro UK. It wouldn’t be the first time a hoax has earned the prankster some substantial money, and likely it won’t be the last. The World Congress on Mummy Studies has previously described Maussan's work as "an irresponsible organized campaign of disinformation," as cited by Metro. “Anything associated with Jaime Maussan a serial promoter of fake alien evidence is suspect,” it added. Popular debunking website Snopes.com has also weighed in on the subject, questioning the authenticity of the find back in June. It cited the ancient practice of artificial cranial elongation as a possible explanation for the appearance of the "fossils." DNA sequencing and CAT scans were carried out on the remains which were allegedly from between 245 to 410AD but further tests are scheduled to be carried out in the near future, claims Maussan. However, one extremely dedicated debunker in Peru has already analyzed the information provided and claims that the creatures’ hands are made of a mixture of bones, including children’s bones. The detailed analysis, carried out by Rodolfo Salas-Gismondi, from the Paleontology Department of the National History Museum of Peru, and associate researcher at the American Museum of Natural History, claims that the anatomical structure of the hands does not make any evolutionary sense and is essentially “incorrect” biologically speaking. This may just be the latest in a never-ending line of alien hoaxes preying on the naivité of sci-fi fans and conspiracy theorists just to make a quick buck but at least there’s some improved production value this time.